LVIV, Ukraine -- Names on the crosses could be hardly read under heaps of flowers and wreathes. On a recent morning, a woman and a teenage girl lay more bouquets on top of 40 freshly dug graves for soldiers killed on the front lines in the Donbass region, far to the east of here. Lviv, a beautiful ancient city on Ukraine’s western border, looked after its dead sons, burying them with honors at Lychakovsky, one of Europe’s oldest cemeteries. Maidan revolutionaries and soldiers are lying here together among graceful monuments to the city’s famous personalities of history, victims and heroes of conflicts and crises in past centuries. Today the fate of Lviv, with its dark memories of Nazi and Soviet terror, as well as past and current wars, is decided by a tall 46-year-old man in glasses, Andrei Sadovyi. For nine years, Mayor Sadovyi has carried out democratic reforms turning Lviv into a model for the rest of Ukraine. He calls his concept for Lviv’s development Open World. His party, Self Reliance, is one of young and talented economists, lawyers and business people who do not obey any of the old political clans. “We are a bone in the throat of the Ukrainian oligarchy," Sadovyi told The Daily Beast. On the other side of the country, the conflict once again has escalated. Both the Ukrainian military and Russia-backed rebel forces report casualties almost every morning. But here in the west, in Lviv, the conflict seems not to interrupt the pace of daily life: Russians and Ukrainians continue to travel by plane and train between Moscow and Lviv. In the evenings colorful crowds of locals and tourists fill up the central Market Square to marvel at medieval cathedrals, graceful statues or just to have a cup of Lviv’s famous hot chocolate on one of the flower-trimmed verandas. On Monday, national Independence Day, President Petro Poroshenko said that the Donbass war has killed about 2,100 Ukrainian military. Many in Lviv wore embroidered shirts to celebrate Independence Day, sang a sad Plyve Kacha song, and shed tears as they remembered the victims. “We drafted our men to the front lines,” says Sadovyi. The mayor spoke with the firm intonation of a strong politician. But Lviv’s society has been tempered by such experiences over the centuries. Lviv has a long history of suffering—people still find remains of Russians killed by Ukrainian nationalists or German Nazi soldiers, and Ukrainians killed by Russian secret police. “Every third man and every fourth woman died from violent murder during the last century,” said the mayor. Painful losses and brutal provocations continue to trouble the city. In late July, a crowd of a few dozen people came out to shout about a “Jewish brotherhood” running Ukraine. “Our eastern neighbor organized that show for the Russian media, the level of anti-Semitism in Lviv is very low,” the mayor said. In the past 100 years, Lviv’s Jewish population, once counted among the most vibrant in Europe, shrank to about 5,000 people, who are now struggling to restore their destroyed synagogue. Through his personal example, Sadovyi has demonstrated that there is a real chance for politicians to get rid of the country’s Soviet heritage. Wearing a traditional embroidered vyshivanka shirt, the mayor walked out on the balcony of his office on Market Square. There are only two stone lions to guard the door of city hall. Anybody from a U.S. military official to a Polish civil society leader or a news reporter can drop by to chat with the mayor. Sadovyi and his young and polite administration are the most accessible politicians in today’s Ukraine. But it is not they who run the country. While the war envelops the east of Ukraine, Kiev, the capital, continues to talk about decentralization. Cities continue to ask for more independence and responsibility. “Back in the 1990s, a few families received a monopoly for business, for political parties and media—their conglomerate has enormous influence in our country today,” said Sadovyi, outlining the true nature of power in Ukraine. 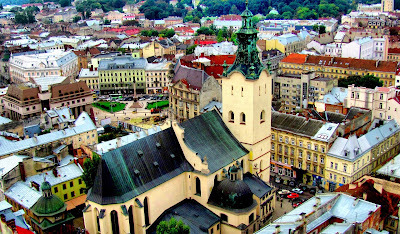 But his Lviv provides a different example with the emergence of new, young, talented, professionals. So we asked him if he thinks Ukraine’s current leadership is serious about reforming Ukraine? “President Petro Poroshenko quoted Lee Kuan Yew: ‘If you want to fight corruption, put three of your friends in jail,’” said Sadovyi. Parliamentary deputies from Sadovyi’s Samopomich (Self Reliance) party criticize Poroshenko and Prime Minister Arseny Yatsenyuk for appointing loyalists to key positions in state companies worth billions of dollars to oversee embezzlement and corruption schemes at a time when post-revolutionary civil society expects the leaders to end such practices. Sadovyi’s critics remember his missteps: the mayor flipping his middle finger at his opponents at one occasion, or turning the city, where the average salary is around $200 a month, into a haven for expensive restaurants, known for “wow!” effects and themes. But there are very few critical voices. “Only Sadoviy can help us create a cultural center for 2,000 Tatars escaped here from Crimea or for 11,000 mostly Russian IDPs from Donbass,” says Alim Aliyev, leader of local Tatar community. “Ukrainian nationalists are against that, but he is our supporter.” Sadoviy’s has pinned hopes on investment projects for dozens of IT companies opening in the city. Dutch CTP plans to invest $50 million to develop the industrial park of IT companies in Lviv. But for big investment projects to succeed, Lviv and the rest of Ukraine need peace and stability.